How it all got started? | Breugel Bouviers Perm. Reg'd. Where to begin? It all started back in Calgary in the early 80’s. My son at the time was into martial arts and the owner of the gym had two of these magnificant creatures. I would go and watch my son during his lessons but, I think I spent more time admiring the two bouviers. I knew in my heart then, that I would one day be blessed with my own bouvier. Many years came and went and after much searching we finally brought our first beloved Bouv home. 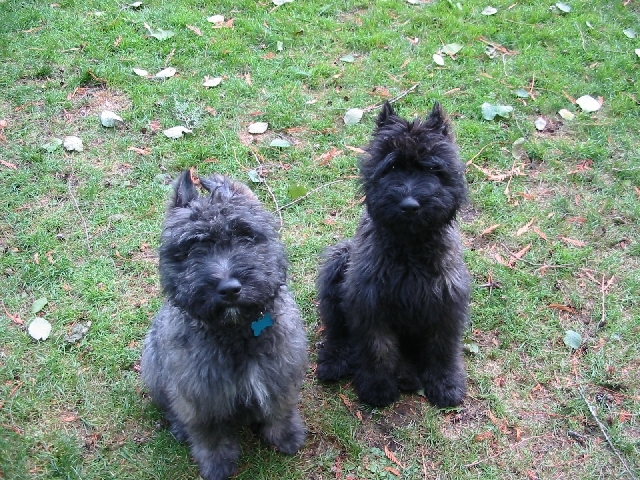 Why I become a Bouvier Breeder? Roxy my 2nd Bouvier, purchased locally was an absolute joy as a puppy, then at 18 months something went horribly wrong and she became a very unpredictable aggressive dog. After working with a master dog trainer for 18 months we had to do the unthinkable and have her euthanized at the very early age of three. Roxy was diagnosed with idiopathic aggression and considered by our master dog trainer “an accident just waiting to happen”. Unfortunately, that day came and will forever be etched in my mind. This gut-wrenching experience is the primary reason why I became a Bouvier breeder. I promised myself that I would do whatever it took to produce Bouvier puppies with sound temperament. Today, my family and I share our home with our wonderful Bouviers. My family, (humans and dogs) live on 10 acres of forest in Roberts Creek, BC. All my dogs are house dogs and beloved family pets. You are welcome to come by and visit with me and my awesome dogs, as I love to show them off. Please just call first to make sure we are home. My responsibility as a breeder, first and foremost is to the betterment of the breed. Which is why I’ve imported my foundation breeding dogs from Europe. Temperament, health then beauty is what my breeding program is all about. To that end, each dog being considered for breeding is 5-star health tested (Eyes, Heart, Thyroid, Hips and Elbows). Only those dogs passing all five health tests are used in my breeding program. I prefer the European look and as such I breed to the FCI standard. My companion puppies are adopted out on non-breeding contracts and are health guaranteed. You can also count on me to support you and your puppy until death do you part. Additionally, I take finding Bouv worthy homes very seriously, so all potential adopters are asked to complete my Puppy Questionnaire. I am a proud member in goodstanding with the CKC (Canadian Kennel Club). Also worth mentioning, my kennel name BREUGEL is permanently registered with the CKC.